The VFC adjusts the fuel mapping under different throttle positions which results in increased power and throttle response, smoother running and eliminates backfiring. 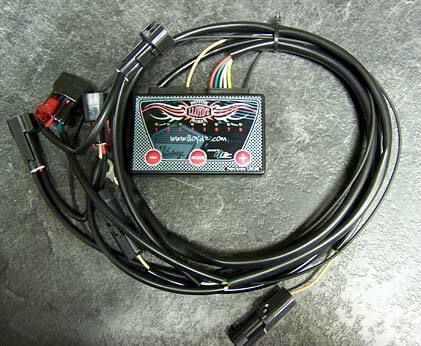 Lloydz new VFC III is the next generation Victory Fuel Controller. In addition to its vastly flexible fuel management tune-ability, the VFC III offers added control for performance fuels like Nitrous. Its architecture allows for future “add-ons” from Lloydz. The VFC simply plugs into the existing injector harness – no splicing or cutting existing wires. All VFCs offer 2-year warranty against defect. Please note that it is ONLY necessary to revert back to a stock download when installing a VFC on 2002-2007 models. It IS NOT necessary on the 2008-later models. The downloads on the 2008-later models are lean enough that it does not drastically affect the tuning of the VFC. The VFC-08 is specifically designed for 2008-later Victorys with Closed-Loop fuel systems and offers improved fuel mapping, better fuel economy, and special programming to eliminate deceleration backfiring. The O2 Sensors must also be disconnected on the 2008-later models when installing a VFC.